At the moment, we're at the gate at the Nairobi airport waiting to board the next leg of our journey to South Africa. It appears that the Nairobi Airport is well on its way to completion of the repairs after the devastating fire many months ago. Little evidence of the destruction was visible to us from our vantage point. The drive and subsequent ferry ride to Mombasa for the flight to Nairobi was pleasantly uneventful. Alfred was on time, the flight left on time and we flew in what appeared to be a newer mid-sized jet. Without a doubt Kenya Airways has their act together. Plus, we paid no excess baggage fees boarding in Mombasa, nor were we charged any excess fees when we checked in with South African Airways to receive our boarding passes to both Johannesburg and tomorrow's flight to Nelspruit/Mpumalanga/Kruger airport. Need I say that we're thrilled? Unloading stuff paid off! The only trying element up to this point was during the time we had to haul everything from Kenya Airways terminal to South African Airways, located in another terminal at quite a distance. With each of us pushing a "complimentary" baggage cart the long distance, it was challenging over the rough roads with no sidewalk and traffic coming right at us. Thank goodness it wasn't as hot in Nairobi as it had been in Diani Beach. Tom helped me over the curbs we had to cross during the long 20 minute hike. A few times a few of the smaller bags fell off my cart but guess who came to the rescue each time? Of course. The almost four hour layover in Nairobi is breezing by after we'd dropped off the bags at the South African Airways check-in desk, especially when once again, no excess baggage fees were charged. Finding an attentive skycap we only had a short wait since South African Airways desk had yet to open. That was certainly worth the KES $1000 tip we handed the skycap after he arranged a quick check in. Once we were again rid of the four heaviest bags, left only with the carry on bags and the cart, we found a cozy café at the airport for a decent bite to eat with excellent service. We were reminded that the Kenyan people provide efficient procedures coupled with superior service, a consisted fact throughout our three month experience. At 4:00 pm, we'll be on board the 4four hour flight to Johannesburg where we'll spend the night until our next flight at 11:00 am tomorrow (Sunday) morning, allowing us ample time for a good night's sleep. With less than three hours sleep last night, I'm looking forward to catching up. God willing, our next two flights in the upcoming 20 hours will be as stress free and seamless as the first and we'll cheerfully arrive in Marloth Park tomorrow afternoon after a one hour ride from the airport. Hopefully, we'll be back late tomorrow afternoon with photos of our new home and, peace of mind that all has gone as well as we'd hoped with our new found freedom with less baggage. Oops! A notice just came over the loud speaker. Our flight to Johannesburg is delayed by two hours. Oh well. As long as we arrive safely, we don't have a complaint in the world! Oops! Another notice came over the loud speaker. The flight is delayed another hour. It was scheduled to depart at 4:00 pm with it now not departing until 7:00 pm. Oh, I need a nap! Another delay! Now we won't depart until 8:20 pm, four hours and 20 minutes late. Yikes! Tom took this photo in the Masai Mara using the little Samsung camera. Wow! It's almost 10:00 am Friday. In a few minutes Tom will go with Alfred, the best taxi driver in Diani Beach, Kenya (click here for Alfred's email), to the ATM and to drop off the remaining empty water bottles for the refunds at Nakumatt. The refund on the bottles is KES $1000, US $11.50 (the value of the US dollar declined $.28 since we arrived in Kenya 3 months ago). With the 3 jugs, we'll receive KES $3000, US $34.50 back. After an exhausting day in the bush, this older elephant was tired of holding up his trunk. So, he tossed it over a tusk to lighten his load. Sounds like us, attempting to lighten our load. The packing is almost completed except for the shorts and tee shirts we're wearing today and the BugsAway clothing we'll wear tonight for dinner at Nomad's, our choice for our final night in Kenya. A driver from Nomad's will pick us up at 7:00 pm for a leisurely dinner at their oceanfront restaurant. "OK, I'll pose for you!" Once we return, we'll pack the clothing we wore to dinner, check our email and go to bed, hopefully getting a good night's sleep. Today, we'll say goodbye to Hesborn, our houseman for the past three months, Jeremiah, our security guard and of course, our gracious hosts, Hans and Jeri. Then, of course, our borrowed pups, Jessie and Gucci, who will each get a hug as they offer up a round of "snappy kisses." 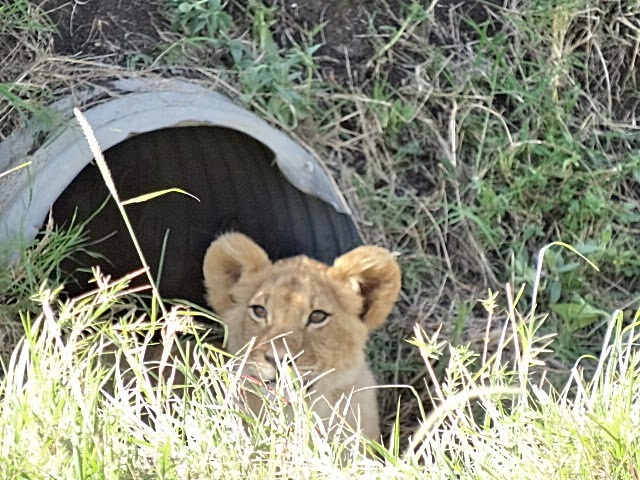 This cub was at one of the ends of a culvert under the road. When she got tired of our photo taking, she got up, walked across the road and re-entered at the other side. What a site! It hasn't been easy for us here. Nor was it easy in the heat of summer with the awful biting flies and bees in the mountains of Tuscany, Italy either. But, Tuscany certainly served as preparation for our more trying time in Kenya. How we've changed. Lions in the Masai Mara seldom climb trees. Anderson spotted this cub and raced across the bush to get as close as possible. The mother lion and more cubs we lying under this tree. Had we known how trying it would be, would we have done it differently? Perhaps. But, we still would have done it. Nothing, and I mean, nothing, will ever match the experience in the Masai Mara on safari or even our three day experiences with the monkey and the snakes at the seaside resort. That is what brought us to Kenya in the first place, the hope of seeing the Great Migration. This lion was sleepy after his big zebra meal (behind him). Not having seen the Great Migration was incidental to the life changing adventure we had in it's place. At this point, we have no need to see it in the future. When Anderson, our guide, took us to border of Kenya/Tanzania to see the end of the Great Migration, the flies were so bad that we had to cover our eyes, mouths and faces. You know how I feel about flies. Only once for a period of 30 minutes, did we have an opportunity to watch the antics of the Colobus monkeys. Many people living in Kenya have never seen a Colobus. Getting this shot made me want to swing from trees. And now, we move on to more heat in South Africa (where it will be summer soon), with more bugs (wildlife results in more bugs), and a new sense of caution for the wild animals in our midst at every turn. Tougher now, we aren't afraid. Instead we're mindful and cautious and, more than anything we're excited and curious. Within minutes of entering our ocean cottage at The Sands Resort for our anniversary holiday, this monkey was peering into the window wondering what we were going to do with our complimentary fruit plate. Many guests feed them putting them on alert each time a new guest arrives. We didn't feed them. This photo was taken through the glass window. Earlier in a post, I' mentioned that we'd share our total costs for our three months in Kenya. This total includes every possible expense: rent, food, transportation, entertainment, safari, resort stay, taxes and tips, fees and airfare and overweight baggage fees to travel here. Every expense, however small, was included, such as a KES $260.85, US $3.00 trip to the produce stand, a beverage purchased at the airport, a tip handed to a bellman. This photo was also taken through the glass (notice reflections) as this young mom came by hoping for some tidbits for her babies. Our grand total for living expenses for the three months in Kenya was KES $1,388,746, US $15,971.78 which averages to KES $462,916, US $5323.93 per month. We are very pleased with these numbers, especially when it includes the high cost of the safari, our anniversary holiday and the frequency of dining out. This winking chameleon made us laugh, especially his funny little mouth. He appears to be made of quality bead work. We met him at the Snake Show at the resort. Tom is holding him. Goodbye, Kenya. Thank you for your friendly people, for your exquisite vegetation, your breathtaking scenery, and for the wildlife that freely exists in your natural environment which your citizens so adamantly protect with grace and reverence. Thank you for welcoming us with open arms, as you proudly release us to send us on our way. Interesting facts about Kenya and Africa...why is Kenya called the "cradle of mankind?" Check back tomorrow for a shocker! From a walk on the beach across the road. One of our favorite views of the Indian Ocean. From the return walk on the beach as the clouds wafted away. Yesterday, after posting a list of the name of groups of various African animals. we went back to the website, this link, from which we borrowed the information and found a number of questions and answers that may be of particular interest to geography and wildlife aficionados. It appears this site originated from an educational program that transpired in Africa over a period of over a month. It was fun for Tom and I review these questions and answers learning much in the process. We wished we'd read this months ago. But, it's never too late to learn. From Hans and Jeri's 3 floor veranda. With an upcoming six more months in Africa, we'll continue to savor its many wonders. Yes, there will continue to be a little whining over the heat, humidity and bugs, but our experiences definitely will continue to make it all worthwhile. The answer to the question, "Why is Kenya called the "cradle of mankind" can be found at this link as well as answers to many other questions about Kenya and Africa. If you have school age children, they too, may enjoy some of the questions and answers on this website. From the yard in Kenya. As for us, our learning continues, not only about the people, history, cultures, wildlife and vegetation of countries we visit around the world but also on ways we can improve the difficulties, costs and challenges of our travels. It's an ongoing process. With so much to do today in preparation for leaving Kenya in 4 days, today is a significant day with much to do. Thus, I will cut this short for today only. On the other hand, tomorrow's post may astound you as it has us. Check back tomorrow for the photos depicting the situation that has kept me awake off and on for two nights. The crescent moon, south the equator is revealed in the bottom of the moon. Thank you, loyal readers, for taking the time to read the relatively mundane story telling of the process of preparing to leave yet another country. At this point, if we didn't share this process, our alternative would be to avoid posting for many days with little else to tell. Nothing pleases us more than sharing photos and accompanying stories that seem to peak the interest of most of our readers. What's to show or tell when the packing in itself is repetitious and boring? But, wait! A week from today we'll be lounging on our new veranda with a tower (see chart below) of giraffes only feet away nipping at the tree tops or a sounder (see chart below) of warthogs getting comfortable for an afternoon nap in the yard or a crossing (see chart below) of zebras staring at us in wonder as they contemplate a drink from the swimming pool. Click! Click! Click! Will the camera be smoking' then or what? With much to do to prepare, to hopefully arrive safely in Marloth Park, South Africa next Sunday by late afternoon, as soon as we have an Internet connection, we'll be posting photos and the story of our arrival. If, for some reason you don't hear from us by then, please be patient. Our flight may have been delayed. We may be delayed at immigration or customs. Who knows what delays may present themselves? We don't worry about possible delays as long as we arrive safely, hopefully with our luggage. Of all the places we've visited thus far, I can honestly say, I've anticipated South Africa the most, mainly based on the opportunity to live in a wildlife reserve, bugs, heat and all. Invariably, when entering the new locations, we've discovered some disappointments that the house isn't exactly as we'd imagine. Human nature. You know how we get a picture in our mind, even with accompanying photos of what something will look and feel like, only to find something different upon arrival. This isn't to imply that the property description was inaccurate or dishonest in any manner. It's just the fact that our brains play tricks on us, helping us paint of picture of "what we'd like it to be" as opposed to "what it is." Moving as often as we have in the past 13 months, we've come to accept this fact as simply a part of the process. In a few days, we'll be settled in, accepting the differences, but oddly never forgetting the image we'd conjured in our minds. I guess this is true in life in every area. So now, I imagine the plastic "vacuum sealed bags" containing all of our clothing, securely closed in our luggage with zippers working and walking out the door of the house in Diani Beach, Kenya five days from today. Carrying with us will be the memories of safari which in this case, were more breathtaking than any vision we may have had in our brains long ago. While playing Gin on Saturday, this ghecko appeared on one of the pillars supporting the roof. It's feet moved in a sticky manner, using each toe in the process seemingly all going in different directions. To compare Friday night's dinner at a popular local restaurant to Sails Restaurant was like comparing dining on a can of Spaghetti-O's to experiencing a gourmet meal of fresh caught grilled lobster tail, prepared to perfection. There's simply no comparison. On Friday night, Hans and Jeri asked us to double date for dinner at a local haunt that typically has been good for them. Not for a moment would we question their taste in good food. However, it must have been an "off night" for the cook. Thus, we won't attempt to tarnish their reputation by our dismal review by mentioning the name of the restaurant. That's not our style. If we have something "good" or "excellent" to say, we don't hesitate to mention the name and at times, include the link for travelers who may be reading from afar. In the event of inferior quality food or service, we tend to stay mum showing our disdain by not returning a second time. With a week remaining until we leave Kenya, a second visit would have been highly unlikely. Thus, I felt compelled to share the first instance in Kenya of a challenge in getting my meal cooked properly to fit my way of eating. Also, for those of you choosing to embark on this manner of eating to improve your health, it's important for us to share less than ideal situations in the event you encounter an occasional dining out fiasco. It is bound to happen. Of course, Hans and Jeri, our dinner companions were as engaging as always and the conversation was enjoyable. Driving with them was a nice break from a taxi. Hans' engine of his car blew long before we arrived and it is still in the shop three months later leaving him no option but to rent a car. The restaurant, not on the ocean, had no breeze and was hot and humid. Dressed in our BugsAway long sleeved clothing, the entire time we were in the restaurant we were sweating more than ever. It's no wonder we love dining on the sea with the cooling ocean breezes! Being hot and uncomfortable almost served as a warning to me that it was going downhill from there. Indeed it did! I was equally enjoying the cool ocean breeze at Sails. Not so much at Friday night's dinner at an off the ocean restaurant. The menu was tricky. Many items were in thick floury and sweet sauces. My choices were limited to grilled fish and vegetables which I often order in one form or another, usually pleased with the result. Not on Friday night! Ordering the grilled red snapper, after giving the server my restrictions list to show to the cook written in Swahili on my smart phone, he returned to the table assuring me that it was no problem. By the time our food arrived, it was 9:00 pm and we were all ready to dine. (We hadn't left the houses until 8:00 pm since most local residents dine much later than our usual 7:00 pm). Once the plate was set in front of me, I immediately knew something wasn't right. The thin snapper fillet was covered in a browned batter, most likely coated in flour. Gently, I asked the server to go ask the chef what was on the outside of the fish. He returned saying, "A little flour." Again in a kindly tone I said, "Please tell the cook to start over, grill the fish, no flour, no batter, no coating, just plain. Plus remove all the vegetables and replace them with freshly cooked vegetables. It is dangerous to my health for the flour to touch the food." Moments later, we heard the cook raising his voice in the kitchen. Ouch! Was he rambling on about my food? I encouraged the rest of our table to go ahead and eat their food while it was hot and I'd catch up later. A new plate of food didn't arrive until 9:25. This piece of fish was flatter yet, perhaps 1/4", .6 cm, and was fried in some greasy substance, swimming in grease on my plate. It was so thin, it didn't have any fleshy portion on the inside of the crisped exterior. The "new" vegetables were on a side plate, were also swimming in grease and grossly over-salted, inedible. Not wanting to make a further scene, especially when everyone else's food was palatable, I ate the fish out of desperation, never saying another word. (Hans tasted my vegetables and agreed they were inedible). By 10:00 pm, after we turned down an invitation to accompany Hans and Jeri at the local disco, we chose the offered ride back to the house, where they dropped us off to go back out. With discos staying open until 5:00 am, neither of us could imagine spending the night in a smoky (smoking is allowed in bars and restaurants), hot, noisy disco with no AC. Returning to our house, still wearing our BugsAway clothing, we decided to watch a movie after I grabbed a bowl filled with raw macadamia nuts, almond and cashews and turned on the fan. That, was our Friday night. On Saturday morning at 10:00, Alfred drove us to Nakumatt for our final grocery shopping, spending KES $8800, US $101, to include three more jugs of water and limited amounts of food items to complete the five remaining meals we planned to cook before leaving, dining out on the remainder. Tom's Crab Au Gratin was as delicious as the last time he'd ordered it. One would assume that a grilled seafood platter wouldn't have flour, grain, sugar or starch but I didn't hesitate to ask the chef to read my list. As it turned out the chef didn't speak Swahili. We could hear the waiter translating it for him from afar, causing us to chuckle. The seafood platter was smaller than the first time, saltier and very greasy. Gee...did those two chefs from each night talk to one another? I ate it anyway with nary a mention. So it goes. It's only food. Right? I'm certainly not starving from a lack of nourishment. As we dined, we both reveled in the cooling ocean breeze, wicking all the droplets of sweat seemingly stuck on our skin for hours. We sat at our usual table closest to the sea. The dining area is under huge canvas sails with giant windows that can be closed in the event of rain or inclement weather. A tourist couple opposite us started complaining that it was too windy for them to eat, insisting that the canvas be lowered to close the windows. My dinner at Sails was too heavy on the oil, very different from the first time I'd ordered this entrée. We were disappointed to lose the cooling breeze as the server hesitantly lowered it when he heard all of the other guests complaining about the shade coming down, blocking the wind and the view. "The squeaky wheel gets the grease," so they say. How annoyed we all were with squeaky wheel! At that point, we started sweating again, anxious to finish eating and be on our way. Why tourists will make fools of themselves, demanding to do it "their way" escapes us. From Friday's less than palatable dinner, for which we paid full price, to Saturday night's less than perfect seafood platter, we've found that gracious acceptance goes a long way over demanding exclamations of annoyance. Also, one must consider that that complaining in a public environment could result in dangerous situation. We're not chumps. We chose this life. Sometimes it is not what we expected or desired. We do the best we can. Over a year ago, when this journey began, we decided we'd accept a situation as long as our health, well being and safety weren't at risk. Before arriving at this house in Kenya, we had no idea from the photos that there was no inside living room, sofa or place to sit. Had we known that, we'd have chosen another property. Would I now ask, whenever we rent a vacation home, "Does it have a living room?" Is that some lesson we needed to learn? But, in the end, we accepted the situation, adapting to spending 16 hours a day living outdoors, making some wonderful new friends, spending fun time with Jessie and Gucci, and experiencing the most amazing adventures of our lives while living in Kenya. Perhaps, we've learned a lesson in the process...we may have become tougher than we'd have ever imagined. Ouch, a bug just bit my foot. I swatted it off. No squeal, no gasp and only a slight mention to Tom, who shrugged. I grabbed the repellent and lathered up one more time. It would be ideal if we could use all of the foodstuffs, cleaning supplies, and paper products that we acquired when spending up to three months at each location. Each time we move into a new location, we've found that we spend a fair sum to stock the new home with the basic necessities. Our goals are simple; don't be wasteful and, don't be wasteful with our money. However, we must admit that we'll be leaving many items behind that are both impractical and costly to pack. Although, we try to gauge how much of any item we'll use, it is frustrating to have purchased grocery items we never used, ingredients for a specific recipe that we never made but purchased with the best intentions. It is those very items that often filled our kitchen cabinets anyway, stuff we may never use, eventually to be donated or thrown away? Plus, no matter where we live, I'm not exempt from the occasional "impulse purchase." When we arrived here, I jumped at the chance to purchase a large bottle of organic "real" vanilla extract for KES $520.50, US $5.76. I'd hoped to find unsweetened "real" chocolate so I could make our favorite sugar free, low carb fudge. Never found the chocolate. Never opened the bottle of vanilla. So it goes. I won't bore you with several other such items we'll be leaving behind. Then, there's the bigger expense that we've incurred while in Kenya, the purchase of "scratch-off" cards for data to "top off" our Kenya SIM cards for our two MiFi devices for Internet connectivity. These are useless to us once we leave Kenya. They don't work outside the country, typical for SIM cards in most countries, tricky for us world travelers. Another area of concern is the disposal of clothing that has either worn out or we've found to have no occasion to wear. The question for today: How will we dispose of leftover, unused, unwanted and no longer relevant items which we have no desire or intention of packing? The food items will be left behind informing Hesborn or Jeremiah to take any of the items they'll use and either leave the balance for future renters or if they choose, for Hans and Jeri. When we left Italy, we'd posted photos of a pile of clothing and shoes we'd left behind for Lisa and Luca, the kindly landlords, to either keep, give to family or friends, or to donate which they gladly offered when we mentioned this dilemma. The clothing, yet to be sorted, is much smaller now that we've narrowed our clothing down to one large suitcase each. Some worn items will be tossed. In an concerted effort to reduce the weight of our bags, we've decided to ship ahead a few boxes utilizing the Ukunda post office that will allow us to insure the contents of the boxes. Alfred will drive us to Ukunda on Friday to ship them off. At this point, we have no idea as to the cost to ship these boxes within the continent. The fact that we're willing to ship them by the slowest possible method to save on the cost should result in our receiving them within a month or so, which is fine for us. Why not toss these items? The biggest issue is the difficulty in finding clothing to fit me. I'm tall and wear an odd size. My inseam is 35" (88 cm). Do I want to take the time to find a pair of pants or dress long enough not to embarrass myself? No. In all of the countries we've visited thus far, the women are shorter than I (here's a chart of the average heights of men and women worldwide). In only nine months I'll need the to-be-shipped clothing items and shoes for two upcoming cruises. One of the highlights of cruising for us is dining in the main dining areas which typically don't allow jeans or shorts. We don't want to be forced to eat in the buffet for dinner due to our lack of proper clothing, which we've only done twice on our eight prior cruises, each time, much to our dismay; once when returning late from an excursion with the main dining room closed and another, on the night of a Minnesota Vikings Play-off game when we loaded trays filled with food to take to our cabin to watch the game. (The TV signal was lost almost entirely throughout the game and, surprisingly, ha, Minnesota lost). Yes, I know in a prior post, I'd mentioned my willingness to forgo style and selection in my attire. But when on cruises, one surely desires to get their money's worth of the meals already included in the fare in the main dining areas. Were it not for this fact, I'd gladly dispose of my few remaining dresses and matching sandals. In any case, we're shipping all of those. We'd already ditched all of our "formal attire" for the dress up nights, falling back on our basic inventory for those evenings since formal wear is not mandatory on most cruises. In essence, it's clothing and shoes that we're shipping. I have six pairs of shoes in my possession and my beloved safari boots. That's all I own: one pair of Keds leather slip ons, one pair of tan 3" heels, one pair of water shoes plus three pairs of Clark's sandals: black, beige and white. (I left my bulky workout shoes in Italy. These can easily be replaced once we're near a health club again). Tom, on the other hand has four pairs of shoes: one pair of tennis shoes, one pair of water shoes and two pairs of Cole Haan, one dressy, one casual and of course, his safari boots. Start adding up shoes alone and they consume an entire carry on bag. Ah, the challenges of stuff, continues to play a role in our lives, although considerably less than it used to. The end result of our clothing issues; we're shipping ahead enough weight in shoes and clothing, weighing everything on our portable scale, in order to avoid paying excess baggage fees when we fly to South Africa a week from today. Once these boxes are shipped we'll share the how much we paid for the shipping. The final items that we've contemplated over these past few weeks, was the remaining data left on our SIM cards on my MiFis. As of today, Tom has 8.7 gigabytes remaining and I have 9.1 gigabytes remaining, more than enough for Tom to watch the Minnesota Vikings game and for me to download several TV shows and movies. We carefully tracked our data usage since arriving in Kenya, in an effort to ensure we didn't leave the country with too much paid-for but unused data. We've determined via our record keeping that our combined average daily usage is approximately .5 gigabytes resulting in our ability to save enough data for the layover at the Nairobi airport. Once we arrive in Johannesburg our devices will not longer work containing the Kenya SIM cards. We're pleased that in the past month it wasn't necessary to purchase additional data by carefully monitoring our usage: no videos other than downloaded TV shows for our evening entertainment and Tom's Minnesota Vikings games. Avoiding the download of Facebook videos was most instrumental in us having ample data to get us through this next week. Yes, we still may have unused data remaining at the end which we hope to use to download movies and TV shows. So, there it is folks. The process of winding down appears more complicated than it is. It requires careful thought and planning, neither of which is foreign to us. As we maneuver our way to yet another country in our ongoing quest for exploration and wonder, we can smile, knowing that we're doing everything we can to make the transition as stress free as possible. Hibiscus bloom daily in the yard. It's 11:30 am Thursday. The humidity is so thick you can see it although the temperature is a little cooler, instead of yesterday's high of 99F, 37C, today it may top off at 90F, 32C, providing us with a some much needed relief. We're ready to go. Oh, don't get me wrong, we're not packed yet. Only a sense of urgency, time being of the essence, will motivate us to begin packing. But, we're ready to go. Bougainvilleas create vines to support the bunches of flowers as they grow heavy. Living outdoors is not for me. Tom has been more resilient about living outdoors than I, as we've spent 16 hours a day living outdoors for the past three months, baring our time on safari, our time on holiday and when out and about. This morning while making my tea, a large ant with wings was crawling on my hand. Many months ago, I'd have let out a little shriek throwing my hand into the air to get it off of me. Now, I merely watched it for a moment, flicked it off with my finger and gave not a thought to where it may have landed. Is this good or bad? Coconut trees in the yard. Last night as Tom sat with my feet in his lap, he noticed a hole in my sock commenting, "You should throw those socks away. There's a hole." I laughed, "Are you kidding? These are the only pair of cotton socks that I have left that cover my ankles to keep the mosquitoes from biting." Our clothes are beginning to wear out. My everyday shoes are worn and misshapen, the shoes I find most comfortable. The four pairs of Clark's comfy sandals I had brought along no longer feel comfy when my feet are swollen from the heat at the end of the day. These look like petunias to me but I could be wrong. They seem to thrive in the heat. When we go out to dinner, I no longer want to wear a long dress in order to "look nice." Instead I wear the comfy old shoes, not the sandals, this last pair of socks and the BugsAway clothes which originally allowed for 70 washings, some of which by now down to 55 washings (does it surprise anyone that I count the washings in my head?) for the Permethrin to retain it's effectiveness. In my old life, in prepping to go out for an evening, I'd easily spend 30 minutes getting ready; the perfect outfit, often changing two or three times if unsatisfied; my makeup, my hair, the matching shoes and purse, the perfect selection of jewelry, striving for what I considered to be the best I could do. Now, I can be ready in 5 minutes. It just doesn't matter so much anymore. I suppose I needed to learn something here. The usefulness of that knowledge escapes me at times. I guess it's all a part of the bigger picture...change. You can teach an old dog new tricks. Simple yellow flowers, always in bloom. Was it the price I had to pay to fulfill my dream of seeing Africa? If so, I gladly paid. I have no regrets, just an indescribable sense of fulfillment and not-to-sound-egotistical, a bit of awe at both of our resilience in exploring this life and rarely, if ever, complaining to one another... for fear of it catapulting out of control. I'm amazed by us: How well we get along together around the clock, never tiring of being together (we never did). How much we've changes. In some ways we were rigid in the past. We continue to make an effort to protect each other from worry (always did with different types of worries now). 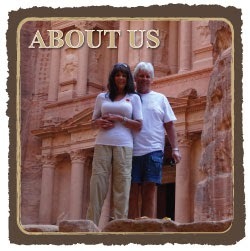 We continue to share in the household tasks and travel responsibilities. (That's new now that Tom isn't chained to a 12 hour a day "job'). I know. As our time winds down, I always roam around the yard looking for vegetation photos to share here. We're ready to go. Several times each day, I glance in the lower right hand corner of the toolbar on my laptop, checking the date, to be reminded once again, how many days until we leave. Today, it's 9. Jessie was sticking out her tongue trying to kiss Gucci. I'll miss them.